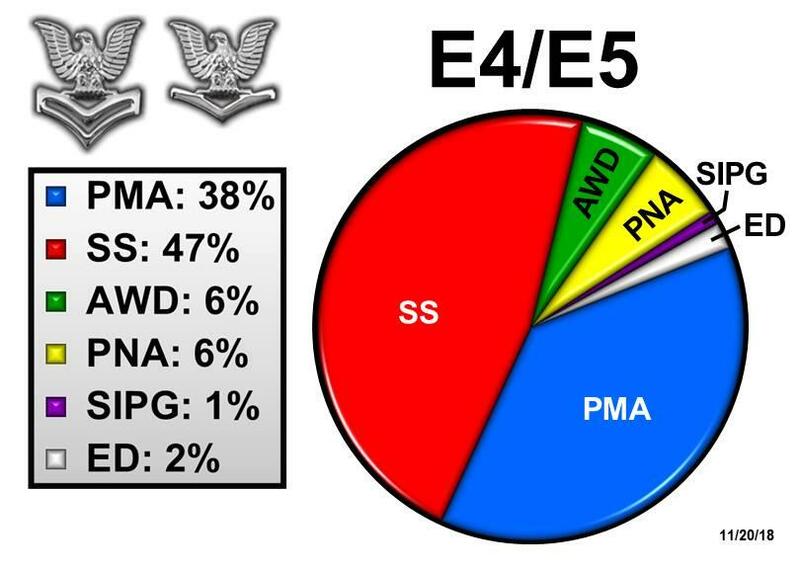 The breakdown of the E4 and E5 Final Multiple Score (FMS) for the upcoming spring advancement cycles shows that the exam standard score will remain as the most heavily weighted factor. FMS changes outlined in NAVADMIN 312-18 reduced Pass Not Advance points from 15 to 9, and also reduced Service in Paygrade by dividing time in rate by 5 rather than 4. Individual Augmentee points will no longer be part of the E4 or E5 FMS, but Sailors with 2-year or 4-year degrees will still get education points. Performance continues to be a critical factor for advancement for all paygrades. The goal of these FMS changes is to reward talented Sailors who show sustained superior performance. These FMS formula changes align with Sailor 2025 talent management initiatives by that adding greater weight to performance measures. NAC uses the FMS to establish a rank order in each rating. Advance-to-vacancy processes result in Sailors at the top of the rank order moving up to the next-higher paygrade.